Villa located 5 minutes drive from the ocean beaches while being quiet in lush greenery. 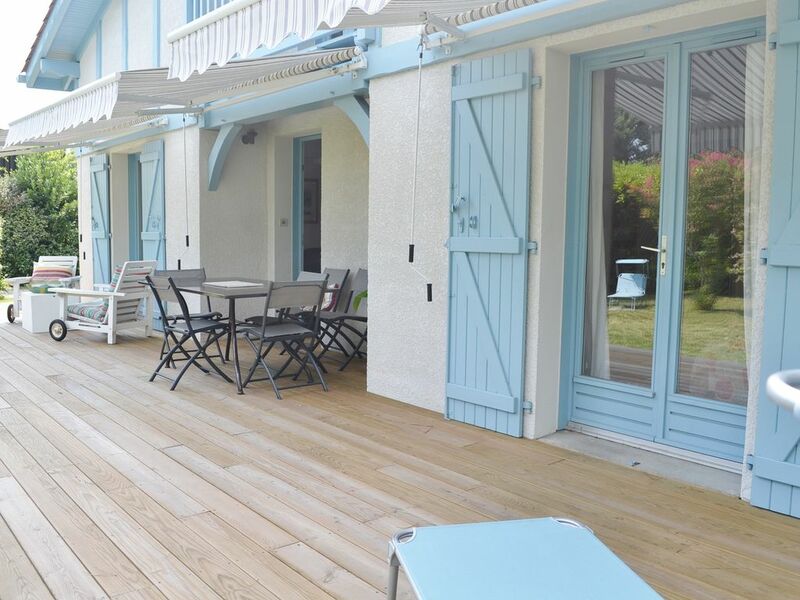 Easy-going holiday home surrounded by wooden terraces that invite you to laze in front of the garden. The kitchen is open to the living room, dining room and veranda. The 2 double bedrooms on the ground floor open onto the greenery. The bathroom is equipped with a double basin and a spacious shower. On the floor, a big room for 4 people and a room of bath with toilet. There is also the mezzanine and a balcony to the east with a bed for 1 person. Easy living in this comfortable house set in a lush garden 5 mn away from world class surf beaches, 6 golf courses in the vicinity and forested dunes to the horizon ..! The house will host up to 9 people and offers 2 double bedrooms with bathroom and toilet, and a large bedroom upstairs for 4 people, a bathroom and toilet. There is another bed on the mezzanine opening onto the balcony. Nous avons été accueillis chaleureusement par les propriétaires. Excellente communication avant notre arrivée. La maison est agréable, trés soignée. Quartier trés calme proche de tout., nous avons loué des vélos non loin de la villa. Nous reviendrons volontierrs ! La maison de Gaelle est très agréable à vivre : rien ne manque. Nous nous sommes sentis tout de suite chez « nous ». L’accueil et les prestations sont irréprochables. L’équipement de la maison est on ne peut plus complet pour y vivre à 8.
maison très agréable et chaleureuse. la propriétaire est vraiment très sympa; Un bon emplacement. Un bon choix pour la région. Super accueil, la propriétaire est très agréable, sa maison aussi. C'est chaleureux, bien placée. merci pour tous les petites attentions de la propriétaire, la région est magnifique. The experience at Gaelle's and Peter's house was superb. The house us very well equipped and kept and it has all the amenities for a family to feel at home. The decoration is beautiful and the garden with the barbecue makes your end of day just perfect. On top of this Gaelle and Peter are fantastic hosts and help you with all the indications to walk ir deive around, restaurants, beaches, surf spots, you name it. They were really nice to us. We shall repeat our stay with them next year! Thank you so much Nuno ! It was a real pleasure to host you and your beautiful children. I am glad you all had an amazing surfing time. O veja logo !